Vail's Lindsey Vonn, shown here during a training run in chilly Canada earlier this month, is preparing to race again in France. She finished 12th in Wednesday's downhill training run at Val d'Isere. 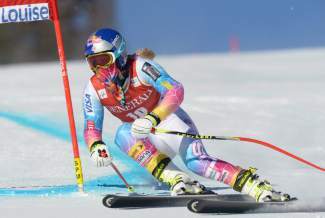 LAKE LOUISE, Alberta — Not far from the finish line she crossed minutes earlier for World Cup downhill training, Lindsey Vonn smiled as she chatted with U.S. teammates Julia Mancuso, Stacey Cook and Leanne Smith. “It was my first run, so I was, of course, a little bit nervous,” the four-time overall World Cup champion and 2010 Olympic downhill gold medalist said. The biggest factor for Friday will be making sure there’s no swelling in her right knee so it won’t affect her thigh’s ability to react and “fire appropriately,” said Vonn, who is three race wins from equaling the World Cup women’s record of 62 held by Austria’s Annemarie Moser-Proell. Vonn said she “can’t really put a percentage on” how hard she was trying to charge and repeatedly acknowledged feeling jitters about getting back on a World Cup slope. She had hoped to return last week at Beaver Creek, Colo., not far from her home in Vail, but her setback from the crash on Nov. 19 scrapped those plans.